In the early 2000s, David Gady set out to demonstrate farm-scale energy production, making his own electricity from residues produced on his family’s farm near Spokane, WA. After several years of engineering and investment, he built a gasification system that meets the farm’s electricity demands and produces a beneficial biochar at the same time. The Gady farm, which produces mostly grass seed and smaller amounts of other grains, includes a seed cleaning mill, which mechanically removes straw, seed coats, and unviable seed from seed crops. The seed cleaning mill not only has a high electricity demand, it also produces large quantities of waste biomass that serve as feedstock for the gasifier. 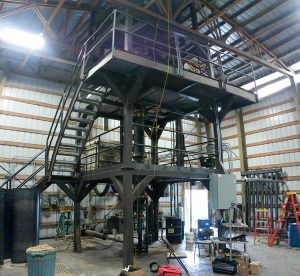 Both the inputs and products from the gasifier stay on-farm, with electricity going back to the seed cleaning mill, and biochar used to amend fields. Field trials at the farm with the resulting biochar showed yield increases in winter wheat of 280% in the first year following application, due primarily to improvements in soil pH, as well as increases in moisture, potassium, and phosphorous status. The Gady gasifier systems was developed and built with support from a Small Business Innovation Research (SBIR) grant from the USDA. It was designed to address several unmet needs: 1) it is intended for lightweight materials, such as chopped straw and seed cleaning residues, 2) it can handle grass feedstocks with high silica content, which tend to form slag, 3) and it was designed to capture and store process heat, in addition to syngas. Biochar is produced at temperatures from 650 to 750°C and at a feed rate of 60 to 82 kg h-1. The biochar is diverted to metal drums using a screw auger, and can be produced at a rate of about 50 pounds per hour. Water is added to about 10% moisture content to cool the biochar, prevent secondary combustion, and reduce dust. The gasifier also produces a synthetic gas enriched in CO and CH4, which can be provided directly to a diesel generator. Trials that used syngas to replace diesel fuel usage by a 100 kW generator determined an electricity production of 36 kW continuous ouput (129.6 MJ per hour of gasifier operation) at a feedstock feedrate of 82 kg hr-1. Heat is captured by a 14.6 m heat exchanger, and although the heat is not currently used, it could be used for heating greenhouses in the future. Usable process heat was measured based on the temperature increase of a 114 l water bath circulated through the heat exchanger. The energy output as heat was 29.2 MJ per hour of gasifier operation, at the 82 kg hr-1 feed rate. The gasifier can use a variety of low density feedstocks, including chopped straw and seed cleaning residues. 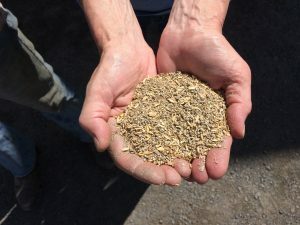 Seed cleaning residues from Kentucky bluegrass, the farm’s main crop, are a preferred feedstock because of their abundance, and because they are easy to auger into the gasifier (chopped straw tends to “bridge” in an auger, whereas seed cleaning residues flow freely). Seed residues are also preferred because they do not have a consistent alternative use. They are not typically reapplied to fields, because of the potential for carrying weeds and pathogens. They do have fairly high nutrient value, however, and are sometimes used by the Gadys for cattle feed. Grass straw is the other abundant feedstock produced on the Gady farm, and would likely become more important if the gasifier operation were scaled up. Leaving residues in-field is itself an important practice for managing soil organic matter (Banowetz et al., 2008). However, collaborators from the USDA Agricultural Research Service looked at crop- and location-specific quantities of residue that are recommended to maintain soil organic matter levels (see NRCS Soil Conditioning Index), and estimated that the Gadys produce considerably more Kentucky bluegrass straw than is needed to meet those recommendations (Phillips et al., in review). Even after leaving recommended levels of residue in-field, Kentucky bluegrass could provide about 7.5 metric tonnes per hectare of dry straw residue (3.3 U.S. tons per acre) in an average year, or about twice the quantity of seed screenings that could be produced from the same area. The seed residue biochar produced by the Gady gasifier has a high ash content (51% by mass) and high liming equivalence (12.1%) relative to other biochars (Trippe et al., 2015). The high ash content also gives it a high pH of 10.2. However, a high pH is beneficial in this region of the Northern Palouse, where acidic soil pH values of 4-5 are quite common. The biochar also has high concentrations of potassium (K), amounting to 3.4% of total biochar mass, and making it useful as a K fertilizer. Physically, the biochar is very hydrophilic, and can hold up to five times its mass in water. Toxicity analyses revealed no detectable polycyclic aromatic hydrocarbons (PAHs), and no heavy metals were detected on eluted solutions (Griffith et al., 2013). An IBI classification label for the seed residue biochar. 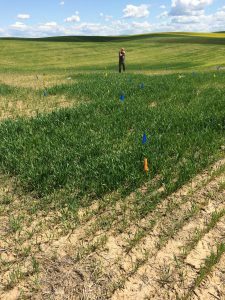 USDA Agricultural Research Service collaborators established test plots on the Gady Farm to compare wheat growth in plots amended with biochar versus hydrated lime. It was expected that the main benefit from biochar would be to increase soil pH, so both amendments were added at rates intended to increase soil pH by 1 unit. For biochar, this amounted to 8 tons acre-1 (equivalent to 1.2% by mass in the top 4 inches, or 6% by volume). For lime, the amendment rate was 1 ton acre-1. The biochar was tilled in to 4 inches depth before planting winter wheat. Plots were established in 2013 and again in 2014, and first year harvests were sampled the following fall. 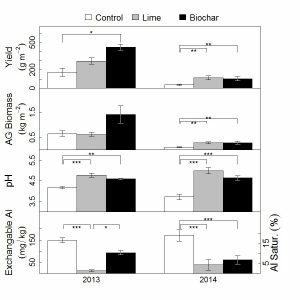 In plots established in 2013, biochar out-perfomed lime, producing greater wheat yields, even though both amendments increased pH about the same amount (Phillips et al. in review). In plots established in 2014, biochar and lime had similar impacts on yield. Overall, biochar increased yields by 280% for both sets of plots, while lime improved yields by only 200%. The additional growth benefits from biochar may have been due to increases in soil moisture, or in soil concentrations of P and K, all of which increased in the biochar plots, but not in the lime plots. Using entirely on-farm feedstocks, the Gadys have produced biochar that is suitable for liming, with soil pH increases that persisted over at least one growing season, and with additional benefits for plant growth, including improved soil water content, increased availability of P and K, and increased microbial activity. 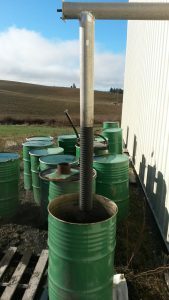 Biochar can help fill an unmet need for producers in NE Washington, where lime has historically not been applied because it is uneconomical. In addition, the gasifier can produced sufficient electrical power to far exceed the demand of the farm’s seed mill (Phillips et al., in review). However, very large quantities of biochar are needed to neutralize soil acidity. 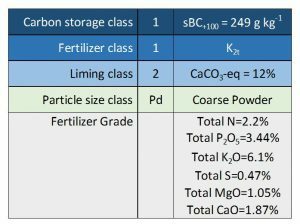 At least two rounds of amendment at the 8 ton/acre rate used in this study would be necessary to fully ameliorate soil pH. It was estimated that if all available seed screening and straw residues were fully gasified, they could provide enough biochar to correct pH on 6-10% of fields annually, allowing the entire farm to be corrected in 9-16 years, without external lime inputs. Alternatively, focusing on applying biochar specifically to the rooting zone, rather than using a broadcast application approach, could allow a larger area to be amended. Developing incorporation methods that do not require tillage is another area for improvement. Banowetz, G. M., Boateng, A., Steiner, J. J., Griffith, S. M., Sethi, V. and El-Nashaar, H.: Assessment of straw biomass feedstock resources in the Pacific Northwest, Biomass Bioenergy, 32(7), 629–634, doi:10.1016/j.biombioe.2007.12.014, 2008. Griffith, S. M., Banowetz, G. M. and Gady, D.: Chemical characterization of chars developed from thermochemical treatment of Kentucky bluegrass seed screenings, Chemosphere, 92(10), 1275–1279, doi:10.1016/j.chemosphere.2013.02.002, 2013. Phillips, C. L., Trippe, K., Reardon, C. L., Mellbye, B., Griffith, S. M., Banowetz, G. M. and Gady, D.: Physical feasibility of biochar production and utilization at a farm-scale: a case-study in non-irrigated seed production, Biomass Bioenergy, In review. Trippe, K., Griffith, S. M., Banowetz, G. M. and Whittaker, G. W.: Biochars derived from gasified feedstocks increase the growth of Triticum aestivum (L.) in agricultural alfisols, Agriculture, 5(3), 668–681, 2015.